U.S. rapper Snoop Dogg performs on stage during the Balaton Sound music festival in Zamardi, 110 km (68 miles) west of Budapest, July 7, 2011. Rapper Snoop Dogg was arrested over the weekend after border control agents found what they said was a small amount of marijuana on his tour bus. The singer and record producer, 40, was stopped at the same Sierra Blanca, Texas, checkpoint on Saturday where country singer Willie Nelson was arrested for marijuana possession in 2010, customs officials said. Bill Brooks, a spokesman for U.S. Customs and Border Protection, said agents conducted a routine inspection of the rapper's tour bus on at the U.S.- Mexico border checkpoint east of El Paso and thought they smelled marijuana. "When our officers did a further inspection, they discovered a small amount of marijuana and turned him over to the Hudspeth County sheriff," Brooks said. 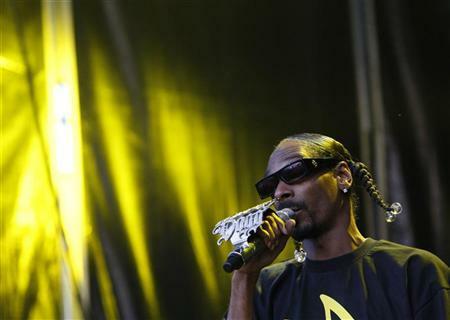 A spokesman for the sheriff's office said Snoop Dogg "freely admitted" the pot belonged to him. He said a dog found a prescription bottle containing rolled marijuana joints and two other containers with marijuana. The rapper was cited for possession of drug paraphernalia, released and given a January 20 court date, authorities said. Snoop Dogg, whose real name is Calvin Broadus, has been arrested and convicted numerous times in the last 10 years for possession of drugs ranging from marijuana to cocaine, and weapons offenses. In 2008, Snoop Dogg and Willie Nelson collaborated on the song and music video "My Medicine," a thinly veiled homage to marijuana. Both artists have made their appreciation of pot an important part of their public personas. The rapper's spokesman could not immediately be reached for comment on Monday.